You Are Here: Home » Around the Web » Is Your Brain Still in Summer Mode? 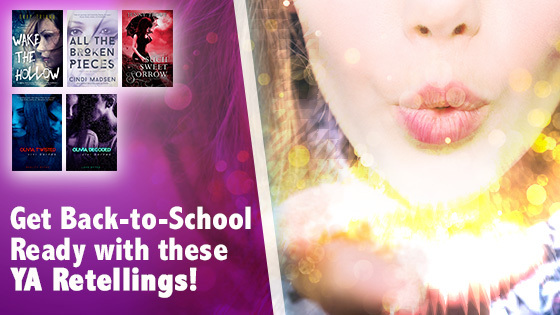 Get Back-to-School Ready with these YA Retellings! Is Your Brain Still in Summer Mode? Get Back-to-School Ready with these YA Retellings! Want to up your summer reading game before school starts? Picking up a YA Retelling (or eight) during Entangled TEEN’s YA Retellings Promo over the next few weeks will help you ease between your summertime pleasure reading schedule and your back-to-school requirements while still being totally swoony and impossible to put down! And the best part is that you can enjoy them whether or not you’ve read the original novels and plays upon which these Entangled TEEN and Crush authors based their YA Retellings. Vivi Barnes‘ Olivia Twisted, the first book in the Olivia Twisted series, which is a modern retelling of Oliver Twist with a female main character, a swoony guy named Z, and in which the characters are computer hackers, not pick pockets. Cindi Madsen‘s All The Broken Pieces, which is a modern retelling of Mary Shelley’s Frankenstein. In this version, Liv wakes up from a coma with no memory of her past and two distinct, warring voices in her head, and as her memories begin to return, she’ll be forced to question not just who she is, but what she is. Gaby Triana‘s Wake the Hollow, which is a modern and spooky retelling of Washington Irving’s “The Legend of Sleepy Hollow.” To update this story, Gaby tells her story from the perspective of a Cuban-American main character named Michaela rather than offer a straight retelling, so even if you’ve ready the original short story, there will be plenty of twists and turns that you won’t see coming! Jenny Trout‘s Such Sweet Sorrow is a YA fantasy that incorporates the characters we know and love from Shakespeare’s Romeo & Juliet and Hamlet but set in an underworld adventure from which Romeo is trying to bring back Juliet and Hamlet thinks he can avenge his father’s death. Vivi Barnes‘ Olivia Decoded is the highly-anticipated sequel to Olivia Twisted, which releases in paperback and eBook formats on Tuesday, September 6th! Just in case you’re new to the series, we’ll be spoiler free, but trust us when we say that you won’t want to miss what happens between Olivia and Z this time. Kendra C. Highley‘s Finding Perfect is a contemporary YA romance that reverses the story of Pygmalion, which was a play where a lower class woman is given the clothing, look, and accent of a high class woman of her time. In Highley’s story, Ben gets a makeover from Paige to make him the kind of guy that the Queen Bee of his school, and Paige’s BFF, would be interested in, but things don’t go according to plan. Alyxandra Harvey‘s Red is a YA Retelling of “Little Red Riding Hood,” which most readers will already be familiar with…but maybe not the way Harvey tells it. Emily McKay‘s How Willa Got Her Groove Back is the first part of a contemporary YA romance that retells the story of Pride & Prejudice, which is oh so swoony. A.L. Davroe‘s Nexis is a YA Sc-Fi novel that re-imagines the story of “Cinderella.” It’s not a straight retelling, but incorporates many of key elements of the story in a futuristic world with a very swoony hero named Guster. Read it now to prepare for the release of Redux, which is coming out on December 6, 2016! To help celebrate these awesome YA deals, we’ve got a bunch of fun events planned for the next two weeks, including a blog series about YA Retellings, some Facebook takeovers from some of our fave YA Retellings authors, a live Twitter Chat, and an amazing YA giveaway. Stop by every day to see what the follow authors have to say about YA Retellings and join in on these other events.